Yesterday we spent our day recovering from our first week of school - we cleaned, organized, filled in calendars, registered for Fall sports and worked on our first set of spelling words :) But LAST Sunday was a little bit more relaxed and we spent some sweet time together at our "Back to School Brinner". 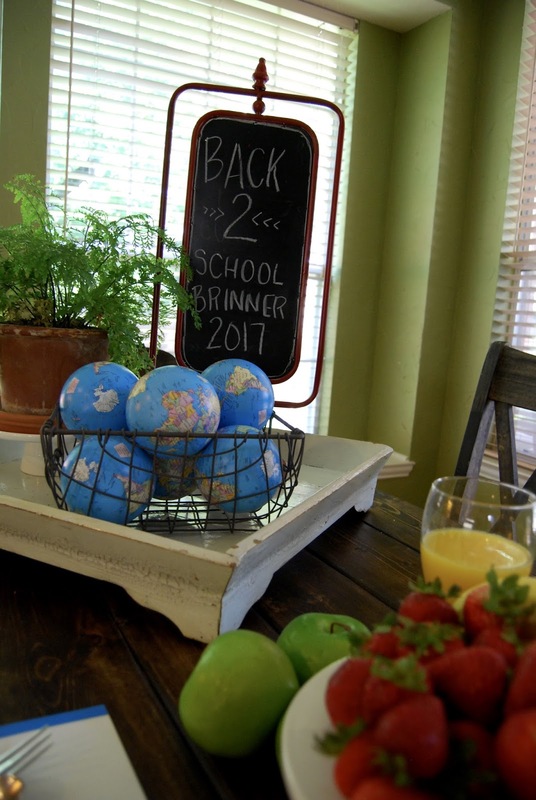 We have to leave our house around 7 a.m. on the first day of school so doing a special breakfast the morning of really isn't an option for us so we do our family meal the night before school starts. 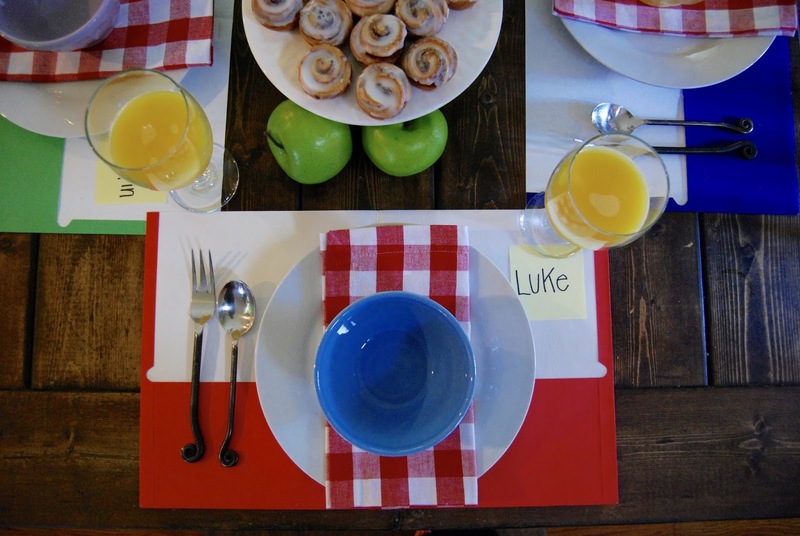 A few thoughtful little touches transformed our typical table into something really special for the kids and they were immediately excited about dinner. A few colorful folders (17 cents each at the grocery store), gingham napkins and faux apples and colorful bowls that I already had and we were good to go! We've always called breakfast for dinner "brinner" and it's one of our absolute favorite meals. We don't do it often, so that makes this little event even more special! Shay's Ultimate Sausage Balls, fresh fruit, cinnamon rolls, yogurt (which I forgot to put out before I snapped pics!) and orange juice. I made a double batch of sausage balls and they were the perfect warm, filling and EASY grab-and-go breakfast for the first week. The folders are so simple and easy and are probably my favorite part of the "decor". The gingham napkins I picked up on Amazon and think they'll be cute for Fourth of July, Christmas and Valentines as well. Cheers for going back to school! Ending summer and having to get back to routines, homework, early mornings and not being in the pool all day can be a hard pill to swallow so we try to go into it as positive as possible :) We try to build excitement and anticipation about going back and this special dinner is such a great culmination of several weeks of picking out backpacks, meeting teachers and working on getting ready to go back. We pray for our teachers, classmates and school. We talk about what to expect the first day as well as goals for the year. It's one of my absolute favorite little family nights of the year! Your table is gorgeous!!! Looks like the perfect way to kick off the new school year! Yay!! I'm so glad you linked to my sausage balls!! Those things are so good! Loved this post so much. Your back to school posts are some of my faves! What a fun way to celebrate the new school year! Great job, mama!! We love brinner over here too!!!! Yours looks A LOT MORE FUN though! I love how you make ordinary extraordinary. Super fun idea! I need to decorate for things like this more! We love breakfast for supper! We call it bright (breakfast at night) though bc Brupper is a little too weird ha! We eat it at least once a month or when I don't want to cook;) we have a "fancy" celebration meal before school starts with candles & wedding China & everything kinda New Years-ish with lots of glitz & sparkle bc it's a new year! (& we love sparkle;) we dress up (if we want) We discuss growth this past year, what we hope to learn, be better at, etc (not just in school but throughout school year) it's a fun night! & then we watch a schoolish movie. & we're up early first day of school morning with yummy breakfast & lots of hugs & songs & gone by 7! & I enjoy my first day with my kids in school! But I'm so ready to see by pickup! Super cute tradition! I love the gingham napkins and the apple centerpiece. I hope y'all are having the best transition back to school. What a great idea! First day mornings can be so crazy. Hope you all have a wonderful school year! We started doing Brinner when my kids were both in junior high. Leaving at 6:45am does not make for a fun back to school breakfast! I just ordered the red napkins...great find! I love this tradition! For some reason, I enjoy making breakfasts much more so than dinner so we do an easy version (and much less pretty) quite often. My kiddos don't head back to school until next week so we might try this out then. Great idea and thanks for sharing! What a great tradition! I love the festive, positive atmosphere you create! So cute as always, Andrea!